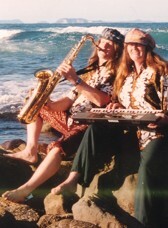 SoulSaxPlus are a New Zealand saxophone duo featuring tenor and soprano sax, vocals, synthesisers, keyboards, clarinet, percussion and original sequenced backings. Styles include a blend of popular jazz, soul, latin, blues, reggae, and original material suitable for Lounge Bars, Restaurants, Concerts, Parties, Festivals etc. Paul Lee: Professional musician for 30 years. Backing singers such as Al Hunter, Josie Rika, Tommy Fergusson, Sonny Day. Teacher, writer, recording and performing artist. 4 original albums. 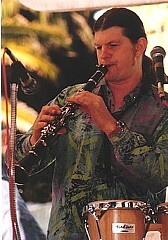 Jani Dennis: Teaching music and music groups, studying World Music and performer and recording artist for Soul Sax Plus. Poolside Bar, White Heron Hotel, Parnell /Summer 93/94. Pier 21 / Summer 93/94/95. Warkworth Hotel / Summer 94/95. MV Kestrel / Feb/July 96. 'South Pacific Sunshine' - CD released November '98. 'Take 5 with SoulSax Plus' - covers album, released November '95. Featured on National Radio's In the Mood, July '96. Nigel Horrocks in Real Groove magazine, May '94. Featured by Judy Collier on National Radio's Home Grown NZ music programme, April '97.